Justin Timberlake had long-been announced as the featured performer for the Super Bowl Halftime Show. This year’s game was in Minnesota, however, which is home to the recently-deceased and much beloved Prince. Almost immediately, people wondered if Mr. Timberlake would give a mini-tribute to the Purple One during his set. You could even bet on it. This is not surprising, considering that Prince is responsible for what is considered the best Super Bowl Halftime performance ever. To not pay tribute to that might be considered heresy. The issue, however, was whether Timberlake would use a Prince hologram. Such a concept was immediately objectionable, because Prince himself had long disavowed such uses of his own likeness before his death. In his own words, he called the practice “demonic.” Nevertheless, Justin Timberlake used a large projection of Prince during his cover performance of “I Would Die 4 U.” Much to the chagrin of Prince’s family. Safe to say, Timberlake did not get full permission from Prince’s estate to use his image during his performance. How is this legal then? Well, we know that Timberlake is allowed to create his own cover of Prince’s music. Prince himself played a Foo Fighters cover song during his 2007 halftime show. The U.S. Copyright Act grants an automatic mechanical license for cover songs, even for public performances, with a few restrictions. Timberlake was therefore perfectly within his legal rights to play his version of “I Would Die 4 U,” even if Prince would not like it. What about using Prince’s image? 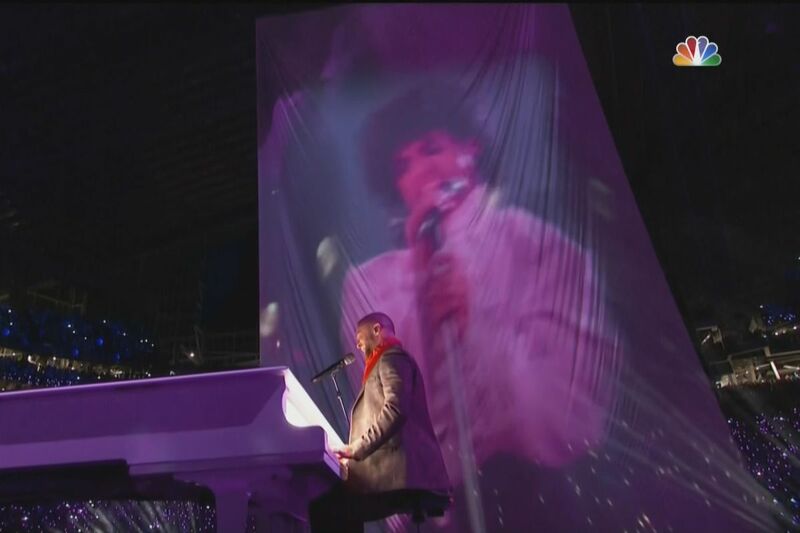 We know that Timberlake used an actual picture of Prince during the show. We also have circumstantial evidence that Prince’s estate did not give direct permission to use Prince’s image, at least not in hologram form. This is where it can be tricky, however. Basic publicity rights in most states will allow Prince’s estate to control any uses of his image, including for the Super Bowl. The estate might also have trademark claims and related unfair competition claims if any imagery of Prince is used to falsely imply sponsorship or association. The actual image that Timberlake used, however, appears to be from the movie “Purple Rain,” which Prince starred in back in 1984. Prince does not own the rights to the movie, including any imagery of his likeness used within that movie. Prince almost certainly licensed all rights to his image for use in the movie, including downstream future uses. Given the magnitude of the NFL and the Super Bowl, it is more likely that the movie studio licensed the right to this image, bypassing the Prince estate entirely. It may be against all of Prince’s wishes for his image, but legally speaking, it was out of his estate’s control. Though, the estate did appear to enjoy the tribute. The most egregious use of publicity rights, however, was Dodge’s use of Martin Luther King, Jr.’s voice and speech to… sell trucks. This commercial was immediately criticized. By many, many, many outlets. The commercial unabashedly is intended to sell trucks, specifically the new Dodge Ram® models, under the guise of being “Built to Serve.” This reminded me initially of the Jarrod Carmichael joke, where he envisioned MLK using his “I Have a Dream” speech to sell mattresses. The difference being that it was always intended to be a farcical joke. People laughed. Dodge went a step further and made it reality. No one is laughing at this. MLK’s image is iconic. His estate, particularly his now deceased wife Coretta, has vigorously protected his name for nearly 50 years. It was therefore jarring to see his name, hear his voice, and have it be directly associated with a truck company advertisement. Especially since the “Drum Major Instinct” speech being used by Dodge left out the part about King questioning the virtues of crass commercialism, i.e. selling cars and trucks. The entire tone of the commercial screamed of cognitive dissonance by Dodge and its marketing department. Naturally, viewers questioned how Dodge could ever get the rights to air this commercial. Certainly the King family objected to the request to use his name, voice, and speech – right? This has to be a violation of Dr. King’s publicity rights, his copyrighted speech and his trademark voice – right? Apparently not. Dr. King’s publicity rights and related intellectual property rights are managed by the entity called “Intellectual Properties Management.” Through this entity, MLK’s estate did, in fact, approve the use of all of his IP rights for this commercial. No matter how tone deaf or tasteless Dodge was for creating this commercial – they had the legal right to make it and air it, with full knowledge and permission by the MLK family and estate. Curiously, the makers of the Oscar®-winning movie Selma went out of their way to not use Dr. King’s copyrighted speeches as part of that movie, so as to not disrespect the King name or his estate. To see his voice used for a commercial given that context is even more disheartening. Dodge may have had the legal right, but it should still feel great shame for exploiting an iconic name. All in the name of selling more trucks to white, suburban men. The last example was not nearly as overt as Prince’s image or MLK’s voice. T-Mobile used an instrumental version of Kurt Cobain’s song “All Apologies” to… sell cellular phones. Yes, that is Nirvana playing over the imagery of babies for a commercial entitled #LittleOnes. I am a huge Nirvana fan. Kurt Cobain’s music inspired me in my most formative years. While this commercial did not use his name or his image, it still struck me the wrong way. The ethos of Nirvana’s music and message is antithetical to mass commercialism and advertising. Kurt Cobain routinely rejected requests to license his music, but his estate has since grown to be worth half a billion dollars after his untimely death. Many people assume that Courtney Love is the one licensing Nirvana’s music to commercials and television, but she has not had control of those IP rights for a handful of years now. Legally speaking, yes, T-Mobile most likely acquired the necessary and proper licenses to use Nirvana’s music. I previously addressed the mechanical license the Copyright Act grants to cover music and sound recordings. The same statute applies here, as T-Mobile did not use the actual sound recording for the original “All Apologies” but instead some xylophone re-creation of the tune. Essentially, this was to make it sound like a lullaby. In a word: blasphemy. Would Kurt Cobain have agreed to license his music to a telephone company for a commercial if he were alive? Of course not. The same would absolutely be said for MLK. Especially given that Dodge took his speech entirely out of context. Meanwhile, Prince was famously protective of his name, his image, his music and everything he did. To think that these three were being exploited during the Super Bowl – the most transparently commercial event in modern American pop culture – is nothing short of cringe-worthy. Nevertheless, all three uses were also entirely legal. These are good examples to demonstrate that what is legal may not necessarily also be ethical or moral. Laws and ethics are in theory correlated, but as we see here, this is not always true. Hopefully, the negative outcry from viewers will put a stop to this trend for future Super Bowls and similar advertising gimmicks. See generally 17 U.S.C. § 115 et seq. See generally Lanham Act, 15 U.S.C. § 1125(a).